Bradford pear (Pyrus calleryana ‘Bradford’) is a spring-flowering tree that has gained popularity in the past 20 years and is frequently seen in nearly every city within its growing range. The species is a native of China; the cultivar ‘Bradford’ is the most commonly planted in South Carolina. The Bradford pear grows 30 to 50 feet tall and 20 to 30 feet wide. It has a narrower and more erect canopy than the species. A rapid grower (12 to 15 feet increase in height over an 8- to 10-year period), it has a short to moderate life span (15 to 25 years). The most attractive feature of this thornless tree is the showy white flowers that appear in spring, usually before the leaves. Early spring flowering may last two weeks, but spring frosts may reduce bloom time. The flowers, unfortunately, have an unpleasant fragrance. Small, round, brown fruit then appear, but are hidden by the leaves. In the fall the leaves turn mahogany-red and sometimes bright orange-red in late autumn. Bradford pear may be grown as a specimen, screen or street tree. 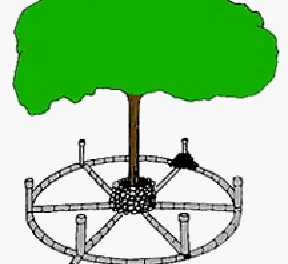 When considering this tree for use in a design, be mindful of its short-to-moderate life span, requiring replacement in about 15 to 25 years. It can be used in urban settings because of its tolerance to pollution. Bradford pear grows best in full sun but will tolerate part shade. It requires low-to-medium fertility. 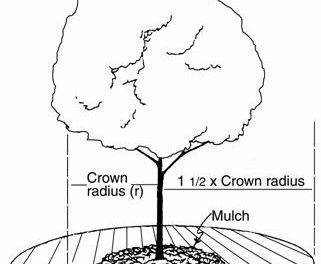 It tolerates most soil types and conditions, including occasional wet soils or drought. The ‘Bradford’ cultivar of callery pear is fairly resistant, although not immune, to most pests and diseases, including fire blight. Fire blight is a common problem of the species where the ends of twigs and leaves become blackened as the disease progresses further down the branches. Affected leaves will remain attached, and a shepherd’s hook bend in the twig may be noticed. (For more information on fire blight of fruit trees, refer to HGIC 2208, Fire Blight of Fruit Trees). Fire blight on Pyrus calleryana ‘Bradford’. 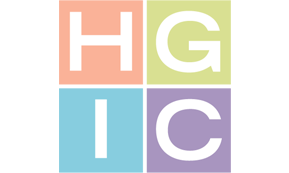 Karen Russ, HGIC, Clemson University. Entomosporium leaf spot that damages the foliage of photinias (red tips) and Indian hawthorns is also a disease of callery pears, such as ‘Bradford’ and ‘Chanticleer’. Reddish-purple leaf spots enlarge to create a general reddening and blight of the foliage. If untreated, this may be followed by leaf-drop. For cultural and chemical control of Entomosporium leaf spot, please see HGIC 1081, Photinia (Red Tip). Entomosporium leaf spot on Pyrus calleryana ‘Cleveland Select’. Alan Windham, University of Tennessee. The Bradford pear is relatively free of insect problems. It does, however, suffer from severe branch splitting, especially in older trees (15+ years). The narrow branching angles cause trees to split in half, especially when subjected to ice and storm conditions. Pyrus calleryana and varieties are on the Invasive Plant Pest Species of South Carolina list. Although the ‘Bradford’ pear was originally bred as sterile and thorn-less, they readily cross-pollinate with other varieties of callery pears, and subsequently produce fruit. The ripened fruit are eaten and disseminated by birds, which results in very thorny thickets of wild pear trees. These escapees are generally unnoticed until spring when the edges of fields are white with blooms. Callery pears in bloom, spreading along the edge of woods in Upstate South Carolina. Consider alternate white-flowered trees to plant, such as white dogwood, serviceberry, white redbud, white fringetree and Carolina silverbell. ‘Aristocrat’ – Although this cultivar has a stronger branching structure than ‘Bradford,’ it is more susceptible to fire blight, which can devastate a planting. It will grow 35 to 40 feet tall and 25 to 35 feet wide. ‘Chanticleer’ – (same as ‘Cleveland Select’). This cultivar grows 35 feet tall and 16 feet wide. Its form is more upright pyramidal than that of ‘Bradford.’ This cultivar has good resistance to fire blight. ‘Redspire’ – This cultivar has a pyramidal form with more yellow than red fall color. It is quite susceptible to fire blight.